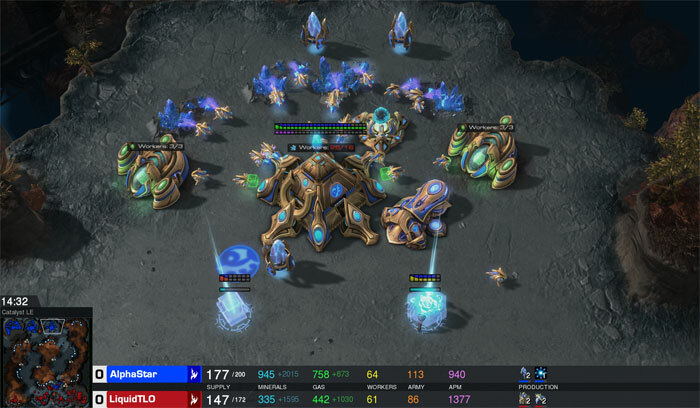 Google DeepMind researchers consider StarCraft RTS games to be among the greatest gaming challenges for AI's. After comprehensively mastering more traditional gaming challenges like draughts, and go, StarCraft became a natural target for demonstrating the capabilities of AIs to work better than humans in complex game environments. HEXUS has previously covered DeepMind vs StarCraft challenges – for instance back in Nov 2017 humans still reigned supreme in this sci-fi RTS. Now DeepMind has come back to challenge the best human players of StarCraft II with its AlphaStar AI. DeepMind reveals that it trained AlphaStar using Google's v3 TPUs running its own game league for 14 days. Each agent in the league had 16 TPUs devoted to it. During training, each AI agent experienced up to 200 years of real-time StarCraft play. To make things fairer in the AI vs Humans battle, DeepMind throttled the AI's actions per minute (APM) to an average of 280 – said to be "significantly lower than the professional players, although its actions may be more precise". 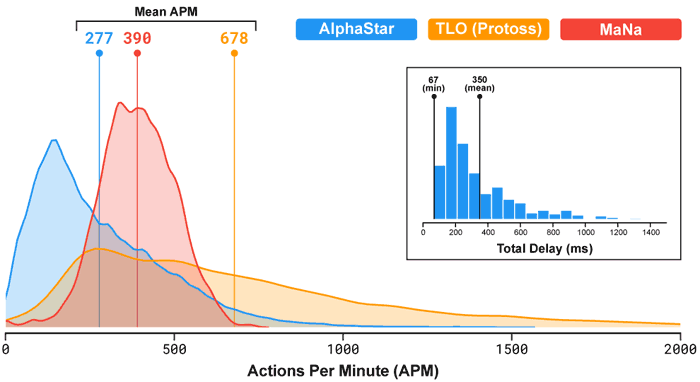 Furthermore, AlphaStar reacts with a delay between observation and action of 350ms on average to mimic quick human minds. Lastly DeepMind tested AlphaStar agents that played in a zoomed-out view of the battlefield and the traditional moving camera view of human players and found no significant difference after enough training days. In summary AlphaStar's success against StarCraft pros was "due to superior macro and micro-strategic decision-making, rather than superior click-rate, faster reaction times, or the raw interface," assert the researchers. In the video the focus is on the five-game matches that AlphaStar played against StarCraft pros Dario 'TLO' Wünsch and Grzegorz 'MaNa' Komincz ahead of the New Year. AlphaStar won 5-0 against both players. However MaNa managed to get revenge in a YouTube and Twitch live broadcast where he got a win against the AI. VentureBeat has some more background info about this separate match. It reports that the AlphaStar AI used in this match was trained for the equivalent of 20 years, rather than 200, and played in the windowed scrolling map perspective. Even with the shorter training span some of its moves and strategies shocked StarCraft fans watching, according to the report. MaNa said that "It was a different kind of StarCraft. It was a great chance to learn something new from an AI". You can download and watch SC2 replays of the above matches via the files available on the DeepMind AlphaStar resource page. this is pretty scary honestly. I remember not too long ago when they managed chess, the advancement is going fast. The scary bit is learning 200years worth of gaming stratergy in 10 days. I love that they have included the Neural Network visual and its consideration trees. Really cool stuff! True, but the one the humans won was the match where the AI couldn't already see the entire map (fog of war on). this is pretty scary honestly. I remember not too long ago when they managed chess, the advancement is going fast. The scary bit is learning 200 years worth of gaming strategy in 10 days. I think we will always jump back. Now considering the innate limitation of not being able to learn 200 years of training within a few days for a human being and also the limitation of reaction speeds where the AI definitely has an advantage over humans. Still the inherent weakness of taking very long to master complex problems even when done at hyper speeds will give the human an advantage in adaptability, at-least for now especially if meta's(game rules) get's changed on the fly. For example if we are talking dota now then I would say we need to get Human's and the AI to train on a certain game version for months and then just before they play the game we change the rules of the game. In this case the AI would probably break or at-least give the advantage to the humans. I know this sounds counter intuitive, but this is real life and if the AI are being trained to face everyday challenges that we as human's face then they will need to know that the rules of the game is not a constant and can be changed at any time. I would love to see a Dota match against AI and human's set up like this so that even with all of the training you have done, that on the day of the game a lot of it may need to be thrown out.